Why He’s Top 40: He’s cultivating community through sustainable living practices. From downtown skyscrapers to suburban neighbourhoods, cities are often defined by their structures and the people who inhabit them. But for Dustin Bajer, a healthy city is more than an urban landscape. It’s a hub for connection, where urban and natural life intersects. The roots of Bajer’s philosophy run deep. As a child, he was intrigued by the contrast between the harmony found in wild, untamed forests and the neverending battle waged against weeds in his parents garden. Later, as a young adult living in Mexico, he was inspired by the way nature had overtaken what remained of Mayan civilization. “I was fascinated with the ecological resilience of these natural areas. I started to think there had to be a way we could partner with nature instead of fighting it,” he says. Upon returning to Edmonton, Bajer began working to bridge gaps between the urban and natural worlds. He continued to study the relationships of plants, animals and insects around him, searching for ways to work in concert with nature. He founded his own consulting company, Public Ecology, and began delving into urban beekeeping and permaculture design while offering free consulting to local schools to help create and run urban agriculture programs. He also started Forest City Plants, a small-scale nursery that finds and propagates unique local greenery. 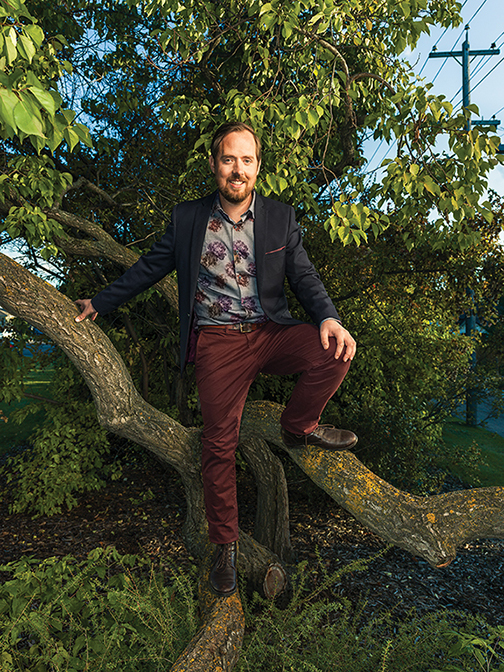 Although he has a number of projects on the go, the goal behind each one is the same: to make Edmonton a more well-connected, ecologically minded community.